When KLANG, the German-based manufacturer of the world’s first truly immersive 3D in-ear mixing technologies, appointed AEM of Tel Aviv, as its exclusive distributor in Israel earlier this year, both parties expressed confidence that the partnership would be fruitful. As the go-to specialist in this sector for Israeli musicians, producers and engineers, AEM’s founder and owner Alon Eitan was convinced that KLANG technologies were game-changers and that his customers would share that enthusiasm. Shalom Hanoch is widely accepted to be the father of Israeli rock music. A career that has spanned five decades and is still going strong, marks him out as a special talent. Critics and fans alike acknowledge that he has had a profound influence on contemporary Israeli music. Equally prolific and highly respected, is composer, producer and performer Matti Caspi, acknowledged as an important driving force in the history of popular Israeli music. Having released around 1000 songs and collaborated with many of the biggest Israeli artists of all time, he is a true musical paragon. 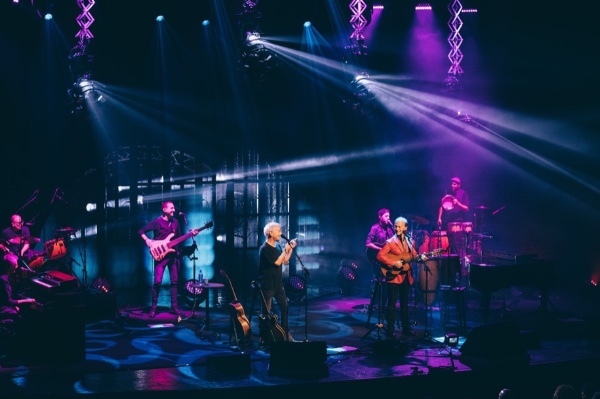 In the autumn of 2018, Shalom Hanoch and Matti Caspi, took their show ‘The Main Thing is The Songs’ on a tour of the country. Working in cooperation with the tour’s production monitor technician Ilan Lamdan, AEM introduced KLANG technology to Shalom and Matti. Alon was a familiar figure to Shalom, having deputised as the latter’s monitor engineer on many occasions over the years. As two of the first users of in-ear monitors in Israel, these experienced musicians were perfect candidates for upgrading to the benefits that KLANG could offer – something that was immediately confirmed after a round of rehearsals at Chaos Studios in Tel Aviv. The tour was sold out and high demand has seen further performances added for later in the year. It received rave reviews, with The Jerusalem Post describing how at the Tel Aviv show “two master performers created a magical, harmonious atmosphere” and referred to their songs as “true classics”. Alon was present during the shows to offer support and guidance but after a very short space of time, the tour technician was fully confident with the system. For the seven musicians onstage, 2 x KLANG:fabrik units were used in conjunction with a DiGiCo SD10, Sennheiser G3 IEM systems, Shure KSM 9 and DPA d:facto microphones.